Greens beans sometimes don’t get the love they deserve. Of course, this time of the year, they are the star side as your holiday Green Bean Casserole. Otherwise, it’s steam the green beans, add a dollop of butter and serve. But what if you used one skillet to build a whole lot of flavor and then served a platter of fresh charred green beans tossed with a Dijon mustard caper combination? What if you added cherry tomatoes for color, hard boiled eggs for flavor and crispy prosciutto strips for a salty crunch? I’d say you have a tasty new way of serving one of this season’s freshest pickin’s! It really does take one skillet (once you blanch the beans and hard boil the eggs) and although some of it is cooked in stages, it all comes together in one delightful garden fresh Gourmet Green Bean Salad! Give green beans a little love this week, won’t you? Hard boil eggs. Peel, cool to refrigerate, then cut into quarters and set aside. Wash fresh green beans and trim the ends. Boil 1 inch of water in a large skillet. (Have a bowl of ice water ready to shock green beans.) When water comes to a boil, add green beans and cook for 2-3 minutes, turning occasionally. (For thin beans cook for 2 minutes, for larger beans, cook for 3 minutes.) Drain beans in a colander and dunk into ice bath to stop the cooking process. When cool, drain beans and set aside. In the same skillet, heat one tablespoon of olive oil and cook shallots until softened and caramelized. Set aside. In same skillet place 4 pieces of prosciutto and cook on both sides until crispy like bacon. Immediately remove from skillet and slice into strips. In same skillet, on medium high heat, spread out green beans and let cook for about 3-4 minutes without turning. When browned, toss beans to brown on the other side. Add Dijon mustard and capers and with tongs, quickly toss beans to coat. On a large oblong platter or flat serving plate, place green beans in a row. Add slices of hard boiled eggs and cherry tomatoes. 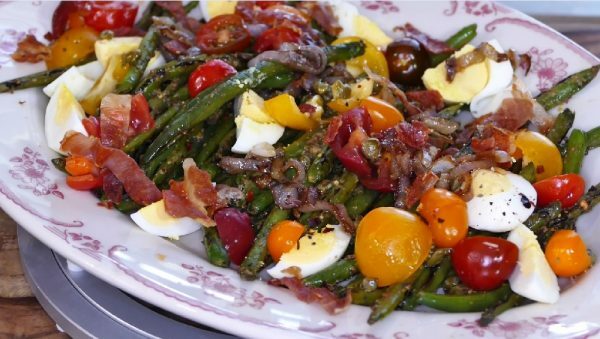 Top green beans with sautéed shallot and sprinkle with crisp prosciutto strips. Drizzle a small amount of extra virgin olive oil over beans and season with salt, pepper and red pepper flakes. Serve warm.